Sea Bay Game Company is happy to announce our transition from a mail-order catalog to a website–based catalog! 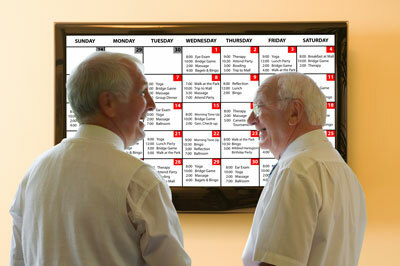 with your residents, such as the innovative TelAgenda Digital Calendar/Message System, Digital Bingo and Trivia, all for the T.V. Along with our expanding digital products, you will find many of your favorites! The Bingo Cube turns your TV into a large screen bingo display. Play bingo manually by clicking on Draw or set the automatic play to a set number of seconds between balls. The randomly played ball automatically highlights on the master board. Audio calls out the numbers. Everyone can clearly hear and see the numbers played. can hear and see the numbers called!